A 19th Century Brass Dredger. 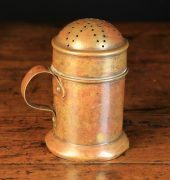 The domed lid pierced with sifting holes; the cylindrical body with strap handle, 5 in (13 cm) in height. An 18th Century Copper Colander with decoratively pieced draining holes to the centre, residual silvering, and a suspension ring to the side, 12½ in (32 cm) in diameter. 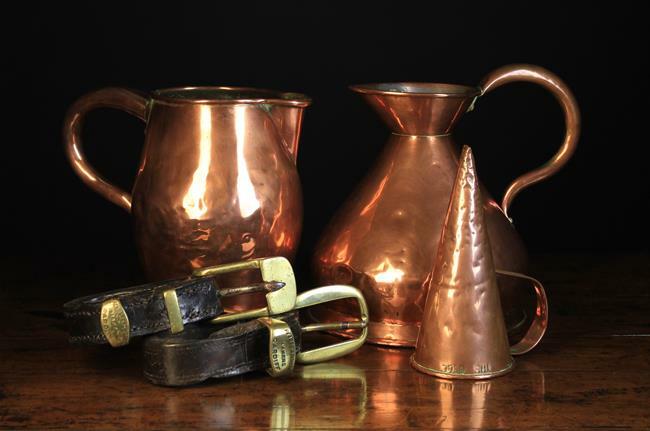 And a large 18th century copper bowl with twin handles and a rolled rim 15 in (38 cm) in diameter. 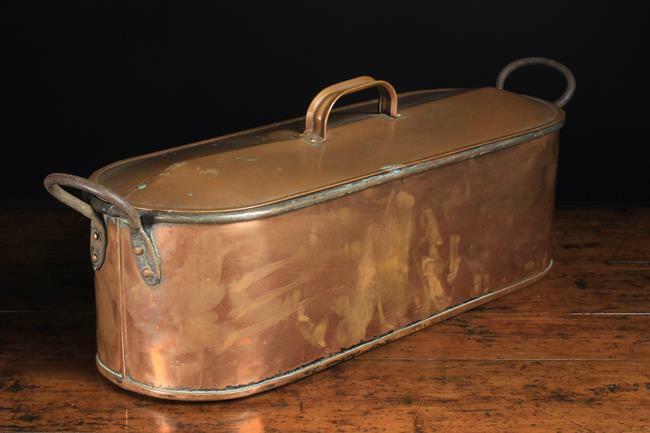 A Copper Fish Kettle. The long D-ended pan with rolled rim, side handles a fitted lid with strap handle and pierced drainer within. 9 in (23 cm) high, 28 in x 8½ in (71 cm x 22 cm). Four Pieces of Copperware: A 19th century gallon measure, a 19th century dairy jug with globular body and cylindrical neck and lid, stamped De La Rue Maker Guernsey on base, a wide straight-sided jug, and a later hemispherical bowl, 10 in (26 cm) in diameter. 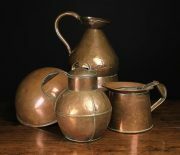 Three Pieces of 19th Century Copperware & two pieces of Horse Tack: A large ovoid jug 9½ in (24 cm) in height, a Gallon measure and a conical pint ale muller with strap handle and rolled rim, stamped THE BELL. And a pair of harness components; the thick stitched leather loops threaded with brass buckles and catches stamped Pearson & Jenkins Makers Cardiff, 9 in (23 cm) in length. 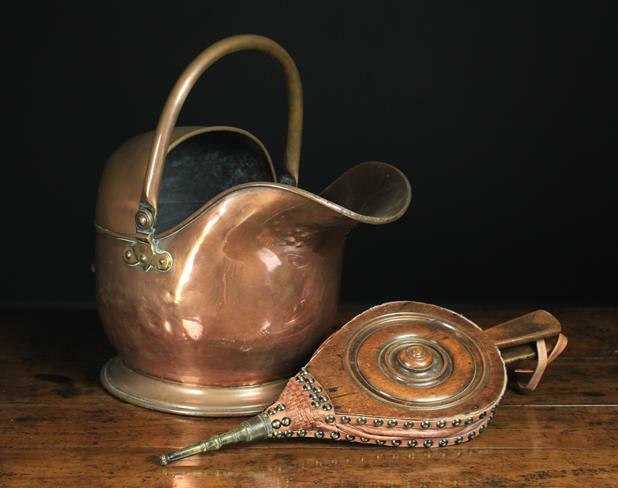 A Copper Coal Helmet and a Pair of Walnut fire Bellows. 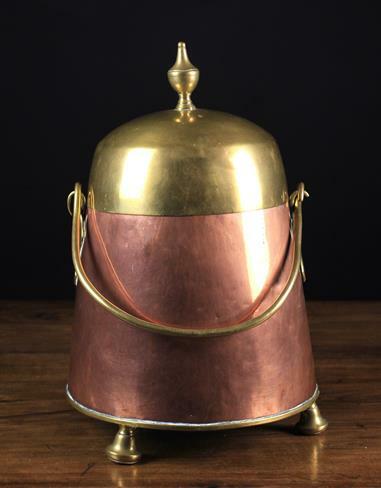 An Early 19th Century Copper ''Doofpot'' or ash pot having a round body tapered to the top with brass swing handle and a brass domed lid surmounted by an urn finial, standing on three knop feet 18½ in (47 cm) high. A Late 17th/Early 18th Century Welsh 'Slatted' Oak Backstool of robust construction. The arched top rail held between finialled baluster supports, above moulded splats leading down to a panel seat (A/F). The turned legs united by multi-baluster stretchers Approx. 47 ¼ inch (120 cm) tall, the seat 18½ in (47 cm) high, 19 in (48 cm) wide. An 19th Century Elm Counter. The thick well-patinated plank top with cleated ends. 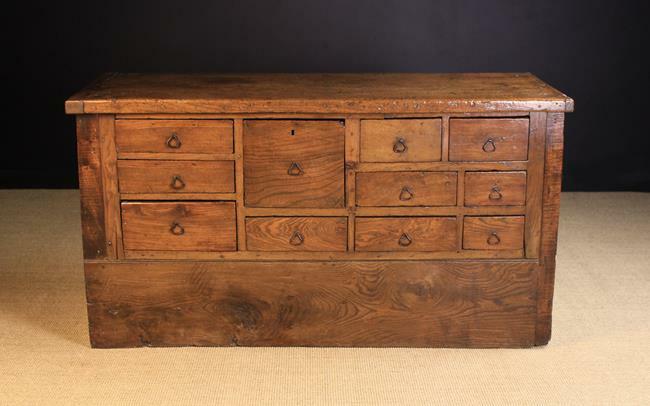 The chest housing an array of various sized drawers fitted with iron loop handles above a broad plain base plank, 30 in (76 cms) high, 56 in (142 cm) wide, 21 in (53 cm) deep. A 19th Century Low Pine Stool of dovetailed plank construction. 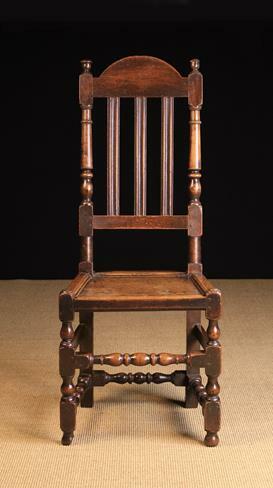 The seat pierced with a handle to the centre and raised on shaped end planks united by a centre stretcher and retaining traces of residual paintwork, 12½ in (32 cm) high, 30½ in (78 cm) wide, 10 in (25.5 cm) deep.